Edited by Gabeba Baderoon, Kate Clanchy, Carolyn Forché, Amanda Jernigan, Anthony Lawrence, Niyi Osundare, Jennifer Rahim, K. Satchidanandan, Michael Schmidt, Bruce Taylor. 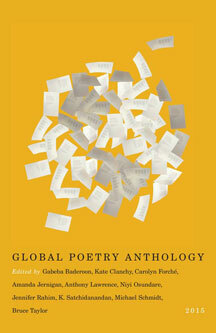 The Global Poetry Anthology 2015 is a one-of-a-kind collection of contemporary poems, previously unpublished, and gathered from all corners of the English-speaking world. The international editorial board ensures the present volume’s cosmopolitan palette and the blind selection process guarantees the selections have been made according to poetic caliber alonge. Véhicule Press’s Signal Editions is proud to offer the third volume in the Global Poetry Anthology series—a rich and exciting mix of established and emerging voices. Gabeba Baderoon is a poet and scholar and the author of the poetry collections, The Dream in the Next Body and A Hundred Silences. She received the DaimlerChrysler Award for South African Poetry and teaches Women’s Studies and African Studies at Pennsylvania State University. Kate Clanchy’s three collections Slattern, Samarkand, and Newborn, have recently been gathered into a Selected Poems, published by Picador. She has won the Writer’s Guild Award, The VS Prichett Prize, and the BBC National Short Story Award for her prose. Her novel, Meeting the English, was shortlisted for the Costa Prize in 2013. Carolyn Forché is a poet, translator and essayist, and editor of two best-selling poetry anthologies, Against Forgetting and Poetry of Witness: The Tradition in English: 1500-2001 (co-edited with Duncan Wu). Her poetry books include Gathering the Tribes, The Country Between Us, The Angel of History and Blue Hour. Her work has been translated into more than twenty languages. She is a Professor of English at Georgetown University, where she also directs The Lannan Center for Poetics and Social Practice. Amanda Jernigan is the author of two books of poetry, Groundwork (2011) and All the Daylight Hours (2013). The first was shortlisted for the League of Canadian Poets’ Pat Lowther Award and included in the National Public Radio’s list of best books of the year; the second was named a best book of the year in the National Post. She is the editor of The Essential Richard Outram (2011) and author of a monograph on the poetry of Peter Sanger. 110 pp 8.5" x 5.5"